The Purdue football program has had a hard time grabbing the national spotlight over the past few years. In fact, the last time the national media took a real interest in the Boilermakers, Drew Brees was the quarterback. However, don’t let the lack of coverage fool you into thinking Purdue doesn’t have anything to offer. Some pundits have said that Purdue is set to have a fairly decent season in 2012, and considering the fact that they dispatched Eastern Kentucky by a score of 48-6, they might be right. While a beat-down of EKU might not sound like much of an accomplishment, a quick look at how some other teams fared in their opening games against a “cup cake” opponent and suddenly a 42-point victory sounds pretty good. Purdue will meet a taller measuring stick this weekend when they travel to Notre Dame to take on the Fighting Irish. The Irish also notched a victory in week one, as they defeated Navy 50-10 in Dublin Ireland. The Boilermakers will have their hands full against Notre Dame, but Purdue might just have that little bit of extra motivation that is required to pull the upset. This motivation comes in the form of a tribute to the late Neil Armstrong. 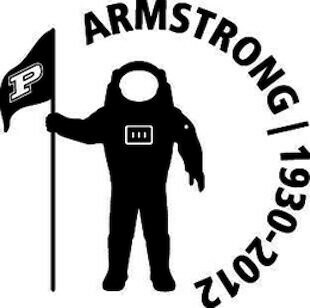 Starting with the game against Notre Dame, Purdue will honor one of their most famous graduates, Neil Armstrong, throughout the rest of the 2012 season. The tribute will take the shape of a helmet sticker depicting Armstrong in a space suit, planting a Purdue flag into the ground. The school has also created a website that covers the life and achievements of Neil Armstrong. You can visit the website by clicking HERE. A win for Purdue on Saturday would really help the Boilermakers in terms of getting them back to where they want to be as a program. Maybe Armstrong can help them get there. This entry was posted in 2012, Big 10, Tribute by Travis Normand. Bookmark the permalink.